Traditionally the approach to the study of wood-decay fungi has been by survey of trees and logs for externally visible fruit bodies. This is, however, only the 'tip of the iceberg' and many organisms remain unaccounted for. The decomposer community consists of fungi, bacteria and arthropods etc. Mammals can play an important part in fragmenting the woody material, thereby making it more accessible to the microorganisms that possess the enzymatic capacity for breakdown of the lignocellulose. Bacteria and fungi can break down cellulose, but it is mainly white-rot basidiomycetes and xylariacious ascomycetes that break down lignin (Rayner and Boddy, 1988; Chapter 2). In undecayed wood there is a surplus of carbon and decomposers have to cope with a limited supply of nitrogen and other nutrients. During decomposition, coarse wood is initially a sink for nitrogen and becomes in later stages a source (Holub et al., 2001; Laiho and Prescott, 2004). However, patterns are complex and in some tree species dead boles function as nutrient sources throughout their decomposition history (Brais et al., 2006). 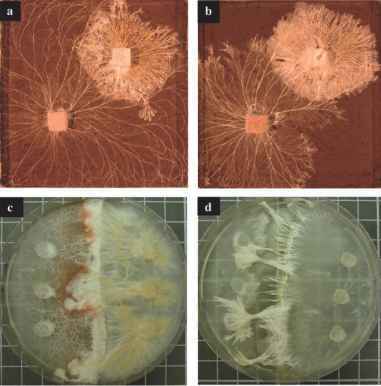 At least four different aspects are important for the nitrogen economy of decomposer basidiomycetes and their capacity to maintain nutrients. (1) Fungi have adapted a nutrient reallocation approach. Thus, for example nitrogen is reused in the mycelium rather than recycled within the environment (Boddy and Watkinson, 1995; Lindahl and Finlay, 2006). (2) During early stage decomposition there is a net import of nutrients into logs. Logs can become a sink for nutrients (Zimmerman et al., 1995; Romero et al., 2005). Foraging and translocation by mycelial aggregates, rhizomorphs or mycelial cord systems, probably play important roles in the nutrient dynamics in fallen logs and stumps (Rayner and Boddy, 1988; Kirby et al., 1990; Chapters 1 and 3). (3) Mycelia may capture small animals and special structures, such as nematode trapping rings, may help in this process (Tunlid et al., 1992; Chapter 9). (4) Bacteria in wood may fix significant amounts of nitrogen; Brunner and Kimmins (2003) reported up to 1-2 kg/ha/year from Vancouver Island. A similar range of nitrogen-fixation was reported for the symbiosis between a cyanobacterium (Nostoc sp.) and the ubiquitous feather moss, Pleurozium schreberi that alone fixes between 1.5 and 2.0 kg/ha/year in mid to late-successional forests of northern Fennoscandia (DeLuca et al., 2002).